After yesterday’s exertion, I woke with a very stiff leg and, first thing in the morning, I even found myself hobbling up the slight incline to the campsite toilet block. Not a great sign for my original plans to walk up nearby Moel Siabod! 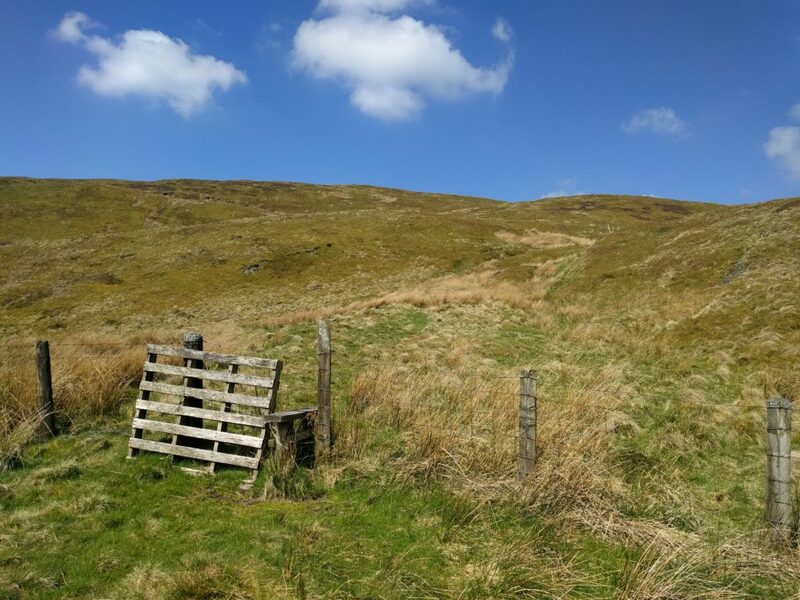 Fortunately, I tend to make backup plans on my SOTA trips and this weekend was no exception, and I had lined up Foel Goch, a 4-point hill that looked somewhat easier, as a fallback. I decided to give it a go. Foel Goch is a lovely hill and very convenient for those visiting North Wales from most of England, since it’s just a couple miles off the main A5 road. I parked at NGR SH 9642 4407, where the road is slightly wider due to a ford, but it later turned out that I could have continued further up the road to around SH 9637 4359, saving 50m or so of ascent. Navigation is easy. From the road, follow the obvious path up the hill along the field boundary to SH 9582 4290. The terrain here is over lovely lush grass, so it’s easy walking, although it does get a bit steep. 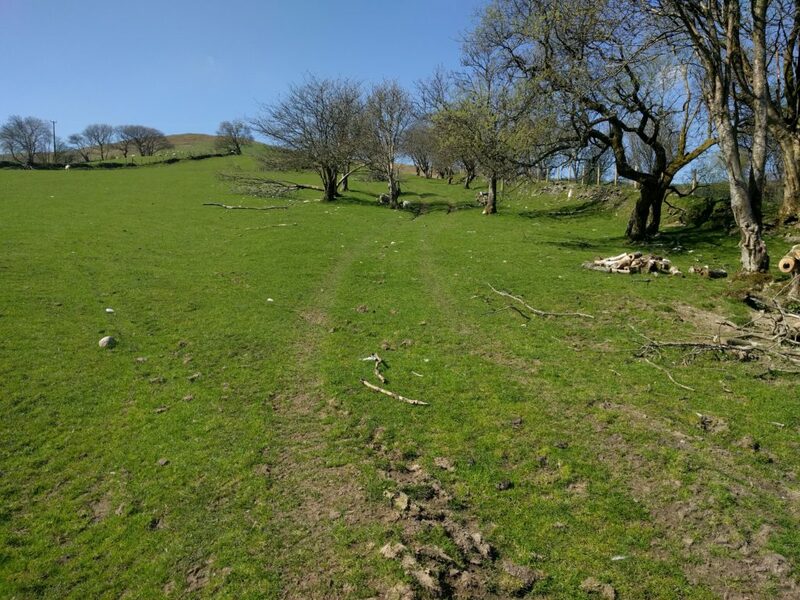 At the top of the field, you take another path (which is mainly flat and somewhat muddy) around the edge of the summit to SH 9585 4241, so that you attack the final climb from the West side. That final climb is then a matter of picking the less-visible track that makes its way straight up over rougher moorland grass. It’s slightly steep but still perfectly do-able. With my leg still a little painful, it took me 1 hour 30 to ascend and 50 minutes for the descent, so under normal fitness, I could have done it quicker. This hill didn’t seem well-frequented, and there’s plenty of space on top next to the trig point, monument and cairn, all of which crowd the highest point. I initially started operating on 2m but struggled to raise anyone, so I instead switched to 30m CW and promptly made 8 QSOs. It was another gorgeous day, and I was feeling a bit better now that my leg had had some exercise, so I decided that I couldn’t head straight back to Cambridge immediately. Instead, I realised that I would be driving home close to the Welsh Borders SOTAs in Shropshire, commonly known as the ‘favourite 5‘, since the five hills are an efficient way to gain Winter Bonus points in that season. I opted to try two of the more westerly hills today, thereby still leaving the easterly ones for after October. There isn’t much to say about Pole Bank. It’s a pretty boring place, and I didn’t even bother taking a photo there. You can drive to very close to the summit and then it’s barely an incline to reach the activation zone. There are gravelled wide paths with heather covering the rest of the ground. The only thing to be aware of is that the approach roads are quite narrow and, in places, have steep, un-barriered, drops around sharp bends. Somewhat counter-intuitively, on my last visit, in the ice in December, this hadn’t been a problem but today there were lots of people out, some of whom were clearly nervous in such circumstances, with short tailbacks forming up the hills. On this trip, I parked at NGR SO 4265 9445, and operated from some clearer, off-path, land around SO 4171 9464. The walk took about 10 minutes each way. 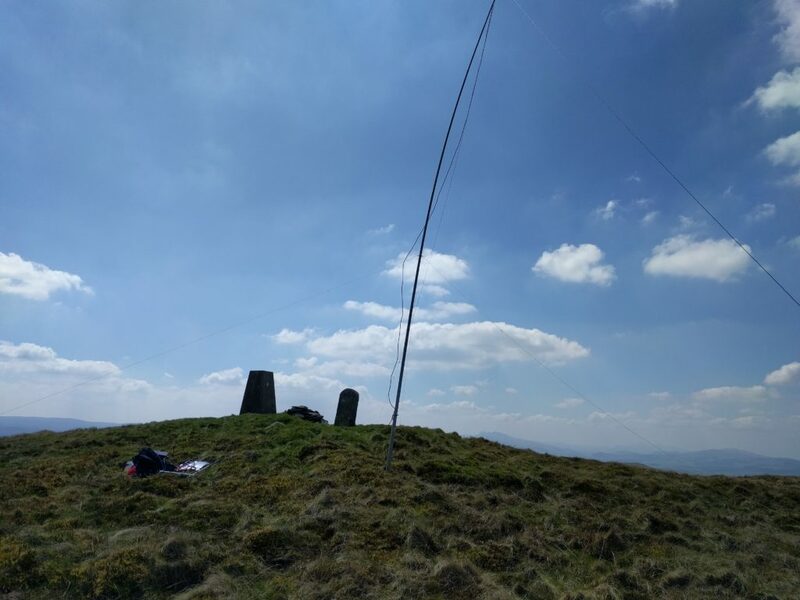 Eventually I made the required 4 QSOs on 30m CW — made especially difficult by the fact that the RBN was down (so no RBN tunnel to SOTA spots) and that I had no mobile signal on the hill to spot myself either. Once the contacts had been made, however, I packed up to head to Stiperstones. It was late afternoon by now, but Stiperstones is only five miles away, so I resolved to continue anyway. 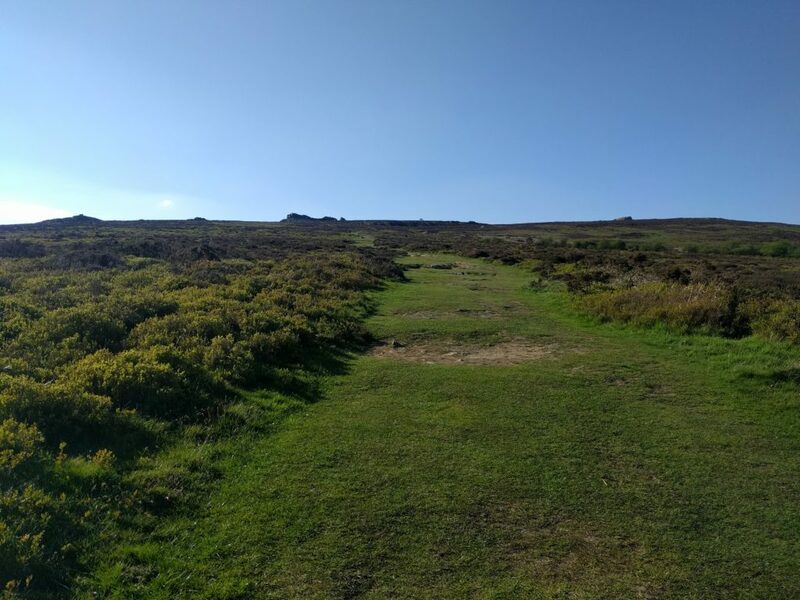 It actually took nearly 20 minutes to drive to Stiperstones, again on small country roads. Back in December, I hadn’t been able to take my car to the large (free) car park at the Stiperstones Nature Reserve due to slipping back on the snow and ice, so I had had to walk further uphill, but there were no such issues today. From the carpark, you follow the wide grass path up the hill to the clearly-visible stone mounds at the top. The activation zone surrounds Manstone Rock, the middle outcrop. I had no option but to return to 2m and call while packing the HF gear, hoping that someone would give me that last contact. Half an hour later, at 18:45, G4VRX (and 3-year old daughter Holly in the background) replied to me and saved the activation. Phew!